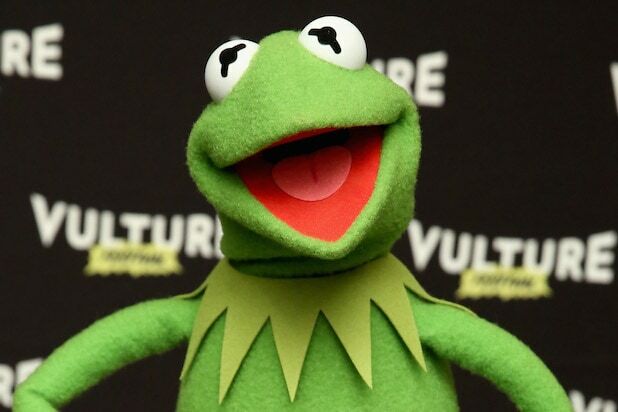 Kermit the Frog first made waves in meme form in 2014 where he was pictured sipping on tea and minding his business. Now, the Muppet is back again, but this time he's made his return as your evil conscious. "Me: It's time for work get up. 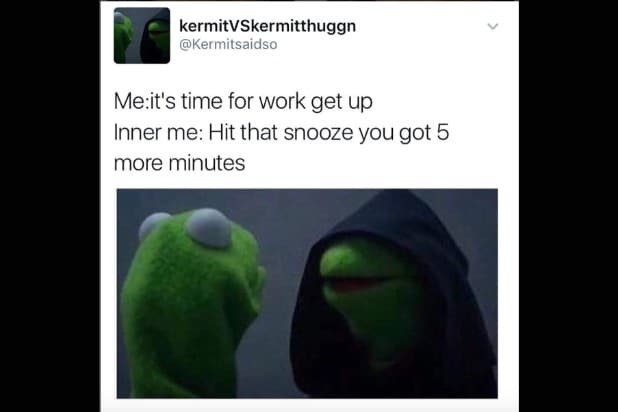 Inner me: Hit that snooze you got 5 more minutes." 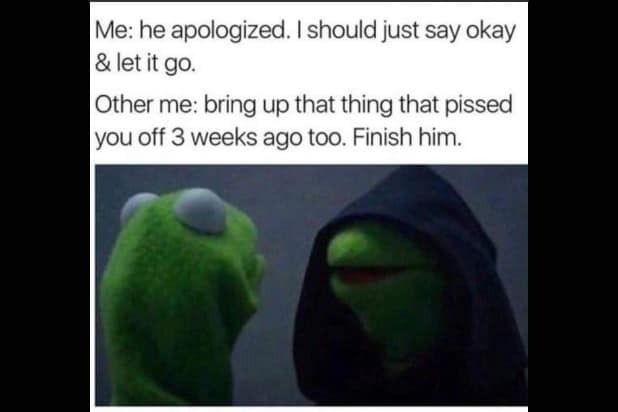 "Me: He apologized. I should just say okay and let it go. Other me: Bring up that thing that pissed you off 3 weeks ago too. Finish him." "Her: These past few weeks with bae have been great. I love him so much. Her to her: You're way too happy right now. Go through his phone." "Me: I just got paid, I should save money and stay in this weekend. My mind: You realize you get paid again in 2 weeks, GET LIT!" "Me: I'm sure there's a logical explanation for this. Me to me: "Overreact." "Me: Sees a fluffy dog." Me to me: Steal him." "Me: Don't make a scene in front of all these people. Me to me: aaaaaaaaand ACTION!" "Me: It's not even worth it. I'm letting it go." Me to me: Get petty. "*Gets a piece of bread* Me to me: Now close it without the twist tie." "Me: I'm so over him.Me to me: No you're not, you should text him.Me: Really?Also me to me: Blow his phone up." "Kanye: So many people hate me... Kanye to Kanye: But not ALL the people hate you...make all the people hate you..."
"Me: He would make the perfect boyfriend. Me to me: Friend zone him." "Me: *sees my siblings being quiet and minding their own business*Me to me: hit them"